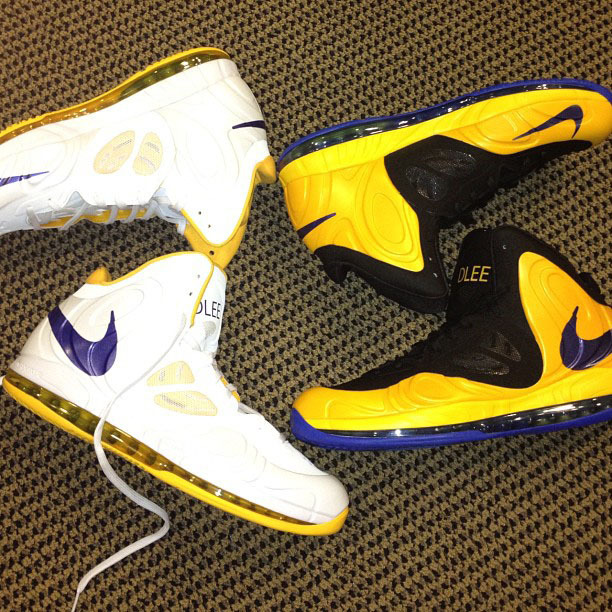 DLEE will return to the court next season wearing these Player Exclusive colorways of the Nike Air Max Hyperposite. Arguably the most under-the-radar 20 and 10 guy in the NBA, Golden State Warriors forward David Lee will return to the court next season wearing these Player Exclusive colorways of the Nike Air Max Hyperposite. David's home pair sports a white base with Warriors inspired yellow accents and dark royal branding, while the away shoe features a gold and black upper with blue highlights. Each pair is personalized with "DLEE" on the tongues. Check both pairs out below. Would you like to see Nike do a HoH on either colorway?